Brilliantly designed and accented with brilliants! I often highlight brilliantly colored focal point stones with accent stones known as brilliants. 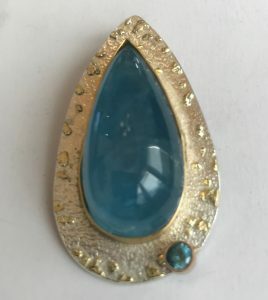 The pendant below presents an exceptional Aqua cabochon as the centerpiece of a brilliantly hand-made tear-drop pendant surrounded by a 22k gold bezel and gold sprinkles – sparkling on the lower rim is an Aqua brilliant. 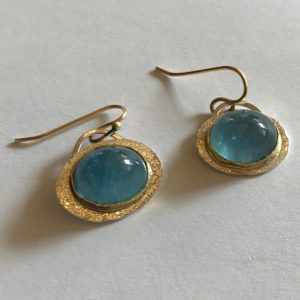 In harmony, small oval drop earrings feature Aqua cabochons with a 22k gold bezel and 14k gold ear-wires finish the earrings. Brilliant is known as the style of cutting a gemstone with many facets of different shapes and sizes which increases its brilliance by minimizing the amount of light that escapes at the bottom of the stone and maximizing the light return through the top of the stone resulting in a brilliant sparkle. BELOW: The Brilliants of the Boxed-Set! Watermelon tourmaline is known as the most colorful gemstone and is found in every color of the rainbow, in many shades and hues – including tones that reflect the 2019 Pantone color “Living Coral”! 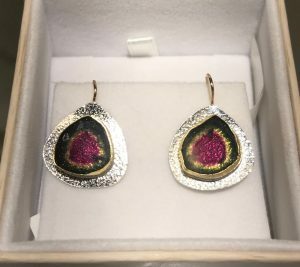 The brilliance of these astonishingly vibrant slices of watermelon tourmaline stones are showcased in a pendant and earrings encased in 22k gold. 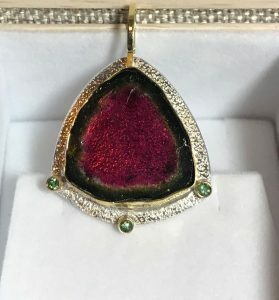 Three green tourmaline brilliants accent the pendant and the earrings have 14k gold ear wires. To admire and acquire fine art jewelry highlighted with expertly cut brilliants, visit Suzanne Brown Jewelry under the big white tent at the Celebration of Fine Art. Open daily 10 am – 6 pm now through March 24 at the corner of Hayden Road and the Loop 101 in Scottsdale, AZ. I’ll be there to welcome you to Studio 230; I’ll be there to help you select pieces that will accentuate your brilliance.